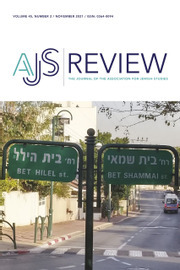 AJS Review publishes scholarly articles and book reviews covering the field of Jewish Studies. From biblical and rabbinic textual and historical studies to modern history, social sciences, the arts, and literature, the journal welcomes articles of interest to both academic and lay audiences around the world. A substantial portion of each volume is devoted to reviews of the latest scholarly Judaica and to review essays on current trends in publishing. Members of the Association for Jewish Studies receive the journal as a benefit of membership.